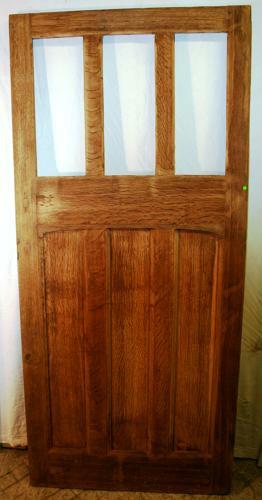 A very attractive and solid, reclaimed, oak door. The door has a fantastic look, with three moulded edge panels and three top panels ready for glazing. The window panels have chamfered edges finishing the design nicely. The oak has been stripped to bare wood and has a rich colour and an unusual, tiger stripe style grain. The door hardwear has been removed and some patch repairs have been made to fill the hardwear holes. The door is reclaimed and therefore has some slight damage and cosmetic signs of wear. There are some slight knocks and splintering to the edges. The base of the door has some light staining and there are some marks and scratches. There are no hinges and all door hardwear will need to be supplied and fitted by purchaser. The door is ready for re-finishing and glazing by purchaser and the door and would look fantastic with both plain and patterned glass. The door is solid and of a great design, giving wonderful style and character to a home.